Did you ever watch your parents or grandparents sit at a sewing machine and work when you were little? Maybe you looked at things your grandmother sewed for you and marveled at how easily she seemed to do it, and your young mind asked, "How does a sewing machine work?" Perhaps you've spent time watching someone quilt with a machine, and you've caught yourself wondering how a machine that never pushes a needle all the way through fabric can sew two or more pieces together. Just how does a sewing machine work, anyway? What Can You Do with a Sewing Machine? A sewing machine is exactly what it sounds like. It's a machine that sews. You hand sew by pushing a threaded needle all the way through one side of a piece of fabric, and then pushing it back through the other side, drawing the thread through. It's a long and arduous process if you're doing much more than repairing a small tear in a seam. Sewing machines use gears and pulleys to create different stitches, and thus, speed up many kinds of sewing. It's hard to answer the question, "How does a sewing machine work," without knowing anything else about them. There are three primary types of sewing machines, each with its own features and uses. Each one is suited to different kinds of work, so it’s important to know what each type is. With a mechanical sewing machine, you do everything except the actual sewing manually, including threading the needle. These are excellent machines for beginners and people on budgets. They cost less than computerized machines, and they’re a lot less complicated. Beginners can learn to use sewing machines without getting confused by a lot of bells and whistles. 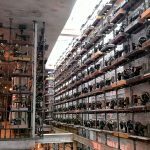 You’re probably picturing one of the old hand-run sewing machines that you see in museums now. Those are manual sewing machines, which we’ll discuss below. Mechanical sewing machines run on electricity. Many have several different types of stitches built in, and a few have LED control screens. However, you’re still threading the needle and bobbin by hand, which means learning how to thread a sewing machine. You’re also adjusting the pressure on the presser foot by hand. Aside from being simple to use, you can maintain mechanical sewing machines yourself. While you’ll still need to take it to a shop if something breaks, you can oil moving parts and clean the machine on your own. You don’t have electronics to worry about destroying. Computerized sewing machines do things like thread needles and adjust their presser feet automatically. They adjust their thread tension automatically, too, and even cut the thread for you. You can also take advantage of the fact that these machines often come with dozens, if not hundreds, of built-in stitches. Sounds great, right? Absolutely. However, these machines also have their drawbacks. One of the biggest is that they’re more expensive but don’t last quite as long as mechanical machines. Unless you do a lot of work on a regular basis, you probably won’t get your money’s worth out of a computerized machine. These sewing machines are the ones you typically see in museums. Today, they’re more like collector’s pieces than they are useful. However, if you want to learn to sew the way your great-grandparents did, you can have a lot of fun with these machines. Since manual sewing machines require you to move a pedal with your foot, you need to learn to develop a rhythm that syncs up with your stitches. For this reason, these aren’t good machines for beginners. If you can find one or you have one in your family, then once you have some good sewing experience under your belt, have fun! Now that you have an idea of what types of sewing machines are out there, you may now be wondering what sewing machine brands are the most popular. Some of the most popular brands include Singer, Janome, Juki, and Bernina. Different brands and models have different purposes, but when it comes to asking, "How does a sewing machine work," they all work the same way. Singer is probably the most well-known name in sewing. They have almost 170 years of experience manufacturing sewing machines of all types. Singer not only invented the world’s first practical sewing machine, but they also developed the world’s first electronic sewing machine and the world’s first computer-controlled machine. Nearly everyone who sews with a machine knows about Singer. Another popular name in home sewing, Janome was the first to develop computerized sewing machines and quilting machines designed for home use. While the company is Japanese, they have a North American division that caters to people who sew as a hobby. Today, their machines are suitable for everything from basic sewing to complex tasks such as embroidery and quilting. Juki got its start in the sewing business in 1945 in Japan, but quickly began selling their sewing machines around the world. They initially focused on home sewing, but are mostly known for their industrial sewing machines used in apparel manufacturing. Juki was the first to develop the rotary needle thread take-up system, and the first machine with automatic needle threading and trimming. Juki came out with the first serger, which is a sewing machine that creates a more durable seam than a standard sewing machine. 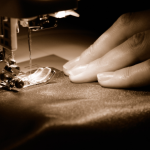 Sergers are great for stretchy fabrics because of the way the seams lock to prevent fraying. These machines also cut extra material from the seams automatically. Founded in 1932, Bernina invented the first hemstitching machine. Since then, they’ve focused their efforts mostly on creative sewing. Today, their computerized machines and creative software are great tools for those who love to quilt, embroider, and do other types of creative sewing. Now that you know all about sewing machines, how does a sewing machine work? The process is a bit complex. It requires a series of gears and pulleys to create stitches. Unlike with hand sewing, a sewing machine uses loops to create stitches. Chain stitches create loops that hold previous loops in place. These are the simplest loop stitches but aren’t especially sturdy. Most machines create a lock stitch, which is a much stronger stitch and uses two pieces of thread. For lock stitches, the needle still leaves a small loop of thread underneath the fabric. However, that loop gets caught and wrapped around the second thread underneath, locking the stitch, rather than pulled directly through the previous loop like a chain stitch. The needle comes back up, pulling the thread tight and locking the stitch, and the process begins all over. All of this happens in the blink of an eye as the presser foot holds the fabric down and the feed dogs feed it through. To learn the full intricacies of a sewing machine’s mechanisms, click here. If it involves sewing, then you can usually use a sewing machine to make it easier and faster. Trying to make your own clothes? There’s a machine for that. Do you enjoy quilting? There are machines for that, too. Basically, you can do anything. Sewing machines make hundreds of fine, tight, and even stitches within minutes. Once you know how to use a machine’s various built-in stitches, you’ll have a variety of projects you can do more quickly and easily than if you tried to do them by hand. Whether you want to create a blind hem, using a zig-zag stitch, sew buttonholes, repair torn clothing, or more, you can do it with a machine. So now that you have an answer to the question, "How does a sewing machine work," are there times when you don't want to use a machine? Well, that depends. If you're going to learn to sew, you might start with hand-sewing. Try repairing something that's torn and see how you like it. You can also hand-sew patches onto clothing. Hand-sewing is its own skill so you shouldn't expect to be able to sew perfectly the first (dozen) times you try. However, it's an excellent way to ease into the art that is sewing, and decide whether to invest in a machine. Hand-sewing is also good for applique and even quilting. It provides a unique touch to your work that a sewing machine just can't. As you gain more skill, you may find that a machine can't give you exactly what you want. That's when you want to step away from it and hand-sew instead. If you ever asked the question, "How does a sewing machine work," at any time in your life, now you know the answer. Knowing how sewing machines work will not only make you more conscientious with your sewing, but it will also help you set up and maintain your machine. It's like any other piece of equipment. The more you know about how it works and what it does, the better you'll be with it.